St. Francis of Assisi was born Giovanni Francesco di Bernardone. He was born in 1181, as one of seven children born to Peitro di Bernardone. His dad was a rich cloth merchant, and his mom Pica, was from France. His dad was in France on business, when St. Francis was born, and his mom had him baptized as Giovanni Di Bernardone. When his father returned to Assisi, he started calling him Francesco, in honor of his commercial success in France. Francis, as the son of a wealthy father, lived the high-spirited life, typical of a wealthy young man. He joined the military and fought as a soldier for Assisi. While going off to war in 1204, Francis had a vision that directed him back to Assisi, where he entirely lost his tatse for his worldly life. He took a pilgrimage to Rome, and while there, begged with the beggars at St. Peter’s. This experience moved him to live a life of poverty. He returned home and began preaching on the streets, and soon developed a huge following. His Order was endorsed by Pope Innocent III, in 1210. Although St. Francis was an Italian Catholic Friar and Preacher, he never was ordained into the Catholic Priesthood. 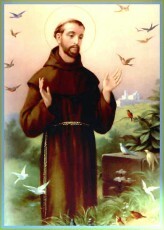 To this day, St. Francis is one of the most venerated Religious figures in history. He then went on and founded the Order of Poor Clares, which was a Cloistered Order for woman. He also went on and founded the Third Order of Brothers and Sisters of Penance, a Lay Order. In 1219, he went to Egypt in an attempt to convert the Sultan. It was around this time, that the Franciscan Order had grown to such and extent, that it needed to be organized. He returned to Italy to organize the Order. Once his organization was endorsed by the Pope, he withdrew more and more from external affairs. In 1223, St. Francis arranged for the first Christmas Manger scene, something that is used today. Until then, it was not something that was used during the Christmas celebrations. It was in 1224, that St. Francis received the Stigmata, making him the first person recorded, to bear the wounds of Christ’s Passion. He died in 1226, at the age of 45, while preaching Psalm 141; “1 I call to you, Lord, come quickly to me; hear me when I call to you. 2 May my prayer be set before you like incense; may the lifting up of my hands be like the evening sacrifice. 3 Set a guard over my mouth, Lord; keep watch over the door of my lips. 4 Do not let my heart be drawn to what is evil so that I take part in wicked deeds along with those who are evildoers; do not let me eat their delicacies. 5 Let a righteous man strike me—that is a kindness; let him rebuke me —that is oil on my head. My head will not refuse it, for my prayer will still be against the deeds of evildoers. 6 Their rulers will be thrown down from the cliffs, and the wicked will learn that my words were well spoken. 7 They will say, “As one plows and breaks up the earth, so our bones have been scattered at the mouth of the grave.” 8 But my eyes are fixed on you, Sovereign Lord; in you I take refuge —do not give me over to death. 9 Keep me safe from the traps set by evildoers, from the snares they have laid for me. 10 Let the wicked fall into their own nets, while I pass by in safety”. On July 16, 1228, just two years after he died, Pope Gregory IX pronounced him Saint. It is customary for Catholics to hold ceremonies blessing animals on his Feast Day, October 4th to this day. He is also well known for his love of the Eucharist, his extreme sorrow during the Stations of the Cross, his Stigmata, and for the creation of the Christmas Creche or Nativity Scene. St. Francis’s life teaches us many things. He was born into a very wealthy family, and walked away from it all, to embrace God, through poverty. He denounced this world, for that of God’s world, emptying himself out, to be filled with God. He founded the Franciscan Order, the Order of Poor Clares, and the Third Order of Brothers and Sisters of Penance, a Lay Order. All of these Orders are in existence today. He also was the first recorded person to receive the Stigmata, and for the creation of the Nativity scene, still used at Christmas, by most Catholics and Christians. He died at the age of 45, while preaching. He was never Ordained a Priest, but founded three Orders that are very vibrant to this day, showing the profound union he had with God, those fruits still very vibrant to this day. He is one of the most venerated Saints in the Catholic Church, more than eight centuries later.